Angela E. Roe, une anthropologue métisse voyage à travers Curaçao afin d’analyser l’un des plus grands tabous de l’île : ce que signifient « la race » et « la couleur de peau » aujourd’hui. Sombra di Koló (L’Ombre de la couleur) s’invite dans cinq quartiers de l’île de Curaçao – une ancienne colonie néerlandaise – chaque quartier se différenciant par sa composition raciale et de classe. Un total de trente Curaçaoens de tous âges et horizons exposent ce que « la race » et « la couleur de peau » leur renvoient aujourd’hui. Productrice, Réalisatrice, Chercheuse : Angela E. Roe. Directeurs de la Photographie : Selwyn de Wind, Hester Jonkhout, Kirk Claes, Octavio Curiel. Etaloneur : Selwyn de Wind. Graphics & Animation : Kirk Claes. Post Production Audio: Ralph Durgaram. Consultant artistique : Felix de Rooy. Assistance de Production: Jeritsa Ignecia, Pito Polo, Giany Martis, Marieke Linders, Anja Steffens, Eugenique Wilkins, Nneka Tielman, Rebecca Steffens, Ryanne Van Der Linde et Vanessa Abad. Angela E. Roe, a mixed-race anthropologist, travels across Curaçao to expose one’s the island of biggest taboos: « race » and « skin color » what do they mean today. Curaçao, a small Caribbean island off the Venezuelan coast, was once an important Dutch colony. It has a population of approximately 140.000 people that is racially and especially ethnically diverse, yet predominantly of African descent and a small white elite. In five neighborhoods on the Island of Curaçao – a former Dutch colony – each neighborhood distinct in its racial and class make-up, a total of thirty Curaçaoans of all ages and all walks of life share what « race » and « skin color » mean to them today. Sombra di Koló / the Shadow of Color is a documentary project by the Warwarú ImageNation Foundation and anthropologist Angela Roe, in co-production with filmmaker Selwyn de Wind. 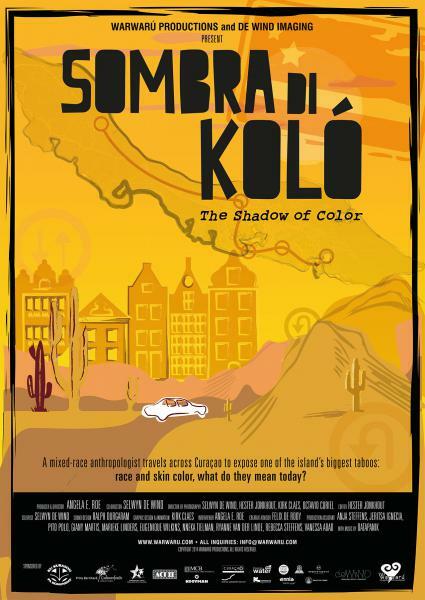 Sombra di Koló examines what race and skin color mean in Curaçao today. Producer, Director, Researcher: Angela E. Roe. Director of Photography: Selwyn de Wind, Hester Jonkhout, Kirk Claes, Octavio Curiel. Graphics & Animation: Kirk Claes. Audio Post Production: Ralph Durgaram. Creative Advisor: Felix de Rooy. Production Assistance: Jeritsa Ignecia, Pito Polo, Giany Martis, Marieke Linders, Anja Steffens, Eugenique Wilkins, Nneka Tielman, Rebecca Steffens, Ryanne Van Der Linde, and Vanessa Abad. Refineria Isla Curaçao B.V., Prins Bernhard Cultuurfonds Caribisch Gebied, Samenwerkende Fondsen Nederlands Gebiedsdeel, Maduro Curiels’ Bank, Kooyman, Act II, Medical Laboratory Services, Curacao Tourism Board, Korpodeko, Burgers & Fung A Loi Notaries, Banco di Caribe, Ennia, Mau Asam Travel, Curacao Ports Authority, Europe West Indies Trading, and KDZ Accountanting Support B.V.
On September 24th, 2014, the documentary will premiere in Teatro Luna Blou, during the Siman di Kultura. Wat betekenen huidskleur en ras vandaag de dag? Antropologe Angela Roe gaat op zoek naar een antwoord. Tijdens haar road trip door de wijken Barber, Seru Fortuna, Otrobanda, Janwe en Spaanse Water vertellen dertig Curaçaoënaars hun verhaal. Het doel van de documentaire Sombra di Koló is het doorbreken van het taboe op de onderwerpen « kleur » en « ras, » en het op gang brengen van een constructieve nationale dialoog over een onderwerp dat ons allen beïnvloedt. Want iedereen heeft een kleur, en iedereen heeft een verhaal. Dus kom kijken, luisteren, en praat mee. Mario Kleinmoedig leidt het debat dat na afloop van de voorstelling zal plaatsvinden. Durante di e « road trip » riba nos dushi isla lo tin diferente Yu di Kòrsou for di barionan manera Barber, Seru Fortuna, Otrabanda, Janwe I Spaanse Water ku lo konta nos tokante nan eksperiensha ku kolo I rasa. E dokumentario ta na Papiamentu, Hulandes I Ingles i ta wòrdu subtitulá na Ingles.